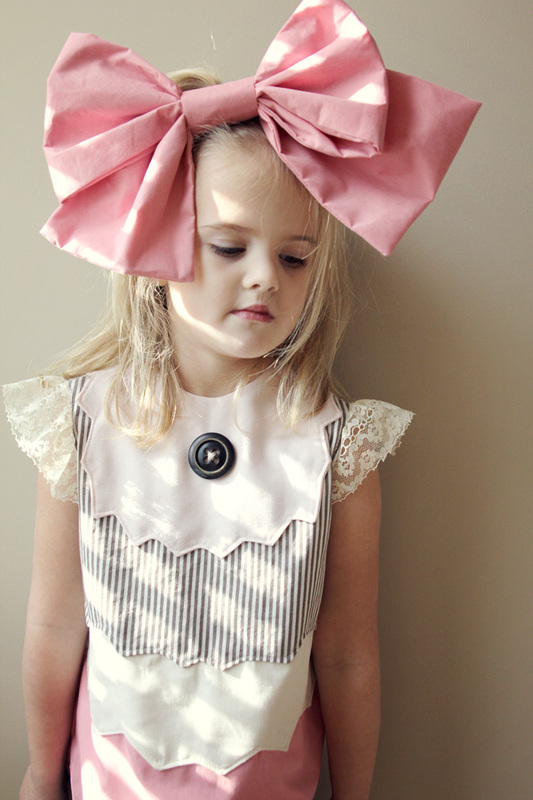 I used neapolitan ice cream as my inspiration for the special occasion/party wear theme at Project Run and Play. Because what is a special occasion without ice cream?? Yep, not special. I worked at an ice cream shop in high school. One of my coworkers once described vanilla as “the perfect flavor.” But add some pinks and browns and mmmm…even better! Jagged layers of “melting flavors”, topstitched together made the body. I hand-drew the pattern pieces to keep the layers organic and fun. We took these pictures inside (and had a fun time doing it, as you can see) because it was way too cold outside for this little dress. The body is really sturdy because of the way I layered the fabrics, but the little sleeves are more of spring/summer wear. I made the sleeves by ruffling lace, I love how the light shows through them! The huge bow declares this girl as the birthday girl. I love oversized elements. check out more pictures HERE! Wow! brilliant work , she look so cute. Again!! You blow me away with your creations and all the charming details!! Super creative idea! I love all your layers but I am super impressed by how they all line up perfectly at the seams! Not easy to do. SO pretty and original! I love the giant bow. I love these layers. So original and so pretty how they all work together. Very fun!! Seriously, this is SO STINKIN’ CUTE!!!! You should be so happy with this design. My jaw fall right open when I saw it! Umm. You are AMAZING! This dress is so beautiful. And the gorgeous model probably helps too! LOVE LOVE LOVE this!! I love the color combo!! Just absolutely adorable!! I love your blog and the creative projects you share. Yum, this dress makes me hungry for ice cream! Danielle is right, matching up those side seams is not easy, and you did it so well. What a fun dress. Gorgeous, just gorgeous! I love it! BEautiful dress and she is just a lovely little lady to! So so so cute, Kate!!! I love this dress. And your daughter is even cuter than the dress itself! What a doll. I just love it! And that bow .. could it be any bigger or better? Such a fabulous ensemble!